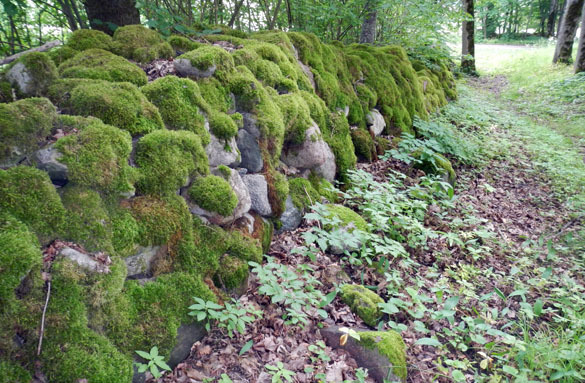 KURESSAARE, ESTONIA–The Wooster/OSU Estonia team continued to explore the Silurian section on Saaremaa Island today. It was our last day with our friend Olev Vinn, and he showed us the only remaining Silurian outcrop here I have not seen: Kübassaare Cliff in the far east of the island (N 58.43259°, E 023.30978°). The image above is the crew on the hike to the outcrop. I wanted to show some of the fantastic greens on this island as a break from the limestones! This is the trace fossil Chondrites on a bedding plane of the Soeginina beds at Kübassaare Cliff. 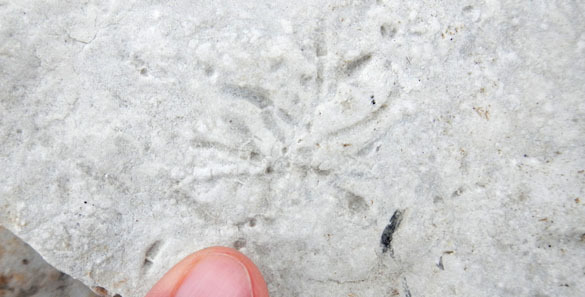 These traces made by deposit-feeding worms are not common in shallow sequences like this, so there is a bit of a mystery here. 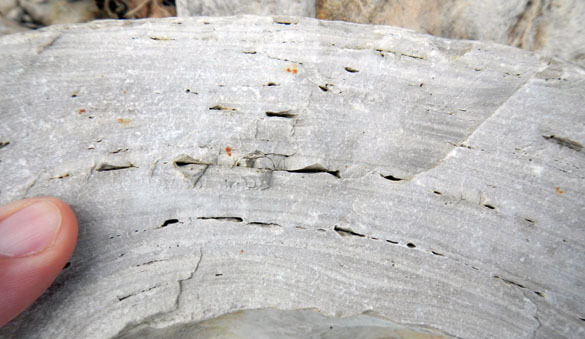 The stromatolites at Kübassaare Cliff are very well preserved and visible in all three dimensions (not just cross-sections in a cliff). They do not seem to have been dolomitized like many of those in the western exposure. 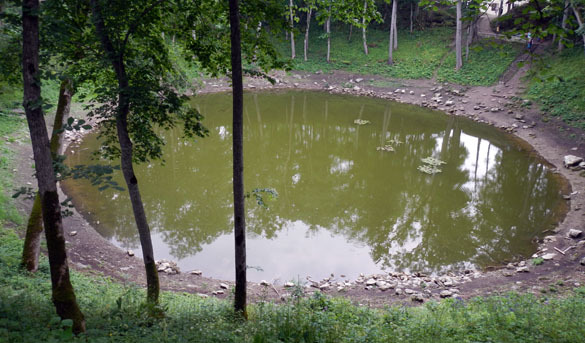 Kaali Crater is a site every geologist must visit while on Saaremaa. We stopped there on our trip back across the island.. I’ve been to the crater many times and so do not need to describe it here. It is an impressive place for the freshness of the crater walls in this very damp countryside. During the Bronze Age there was a structure built around the crater walls. Whether it was a fort or some kind of religious enclosure is not known. I only noticed today that there are still the remnants of a very mossy stone wall on the periphery of the crater. At the end of the day we returned to the southwestern coast of Saaremaa, on the Sõrve peninsula, to Kaugatuma, site of the crinoid-rich Äigu Beds (N 58.12449°, E 022.19446°). Bill and his students found some spectacular crinoid specimens, including new calices and a kind of holdfast I had not noticed before. The rain ended (mostly) and we were able to end our day rather leisurely examining this spectacular outcrop. Tomorrow we split up for separate field localities. The Wooster geologists are returning to Kübassaare Cliff to measure and sample the section as the centerpiece of Richa’s Independent Study project; the OSU team is heading to the northern coast of Saaremaa to collect more crinoids from the Ninase Member of the Jaani Formation. We aready know it is going to rain! 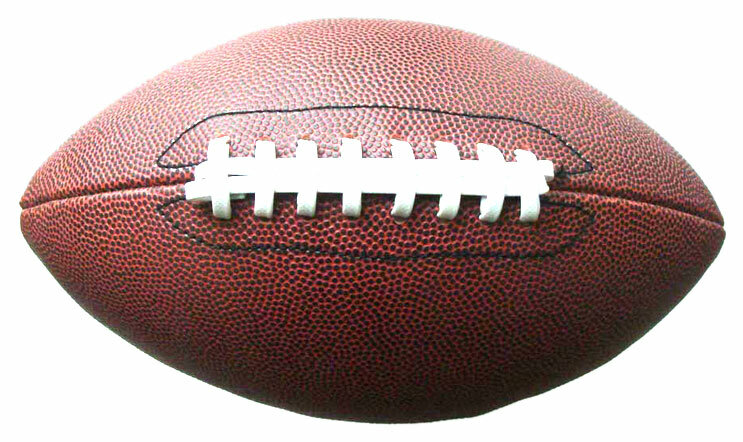 They look like little footballs, at least the American variety of football. Fusulinids (the name indicating the fusiform shape) are about the size and shape of wheat grains. They were marine protists (single-celled eucaryotes) that lived from the late Early Carboniferous to the end of the Permian Period. 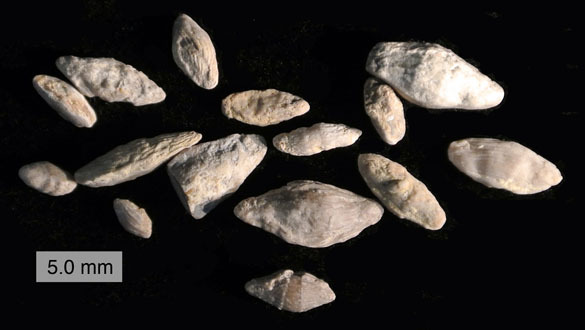 Fusulinids are foraminiferans of the Superfamily Fusulinoidea named by Valerïan Ivanovich Möller (Imperial School of Mines, St. Petersburg) in 1878. They are critical index fossils for the Late Paleozoic, and I knew them intimately during my dissertation work in southern Nevada. The shell of a fusulinid is very complex. It is made of a granular calcite wrapped along the axis of the football in a series of chambers with internal walls. Each coil wrapped completely over the earlier coils, making the shells involute. They are most commonly studied in section to reveal the internal complexity. Cross-section of a fusulinid (Triticites) from the Permian of Iowa. Fusulinid evolution was dramatic for a single-celled group. The earliest varieties were very small (one or two millimeters in length), and the later ones up to five centimenters long. Their internal features also increased in complexity, making each successive new species very easy to identify. This is why they are such good indications of geological time intervals. It is this biostratigraphic value that proved most useful to me as a young graduate student working in what seemed to me to be virtually featureless Carboniferous limestones. Hageman, S.A., Kaesler, R.L. and Broadhead, T.W. 2004. Fusulinid taphonomy: encrustation, corrasion, compaction, and dissolution. Palaios 19: 610-617. Möller, V.I., von. 1878. Die Spiral-gewundenen Foraminiferen des russischen Kohlenkalks. Mémoires de l’académie impériale des sciences de St-Pétersbourg, VII Série, Tome XXV, No. 9 et dernier. Ross, C.A. 1967. Development of fusulinid (Foraminiferida) faunal realms. Journal of Paleontology 41: 1341-1354. Stevens, C.H. and Stone, P. 2007. The Pennsylvanian–Early Permian Bird Spring carbonate shelf, southeastern California: Fusulinid biostratigraphy, paleogeographic evolution, and tectonic implications. Geological Society of America Special Paper 429, 82 p.